Avoid a clogged drain with these helpful tips! Slow or clogged drains are a pain. Most people don’t really give their drains a whole lot of thought until they slow down or stop draining altogether. If your drain is starting to slow down, do something as soon as you notice it. You can get liquid drain cleaner at your local hardware store. 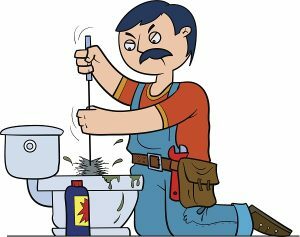 If you’ve already done that and the drain is still slow, call the experts at Master Plumbing and we will come see what needs to be done. Don’t wait! A minor nuisance now prevents a major headache down the road. Here are a couple of tips to follow so you can maintain your drains between cleanings. When it’s time to run the garbage disposal, you shouldn’t just turn it on and off. Before you turn on your garbage disposal, turn your cold water on full blast. Run the disposal until it’s finished. After you turn the disposal off, run the cold water for a few more seconds to flush out as many food particles as you can. The cold water will help keep the food from sticking in the drain, which will prevent clogging. NO Grease in the Drain! Please, just pour it into an empty tin can or something. You may think that since it’s liquid it’ll just run down, but it doesn’t. Grease and oil are not water soluble, meaning they don’t just dissolve in water. In fact, grease really doesn’t mix with water at all. What that means for your pipes is that the grease and oil deposits actually just build up along the walls of your pipes, which over time causes all kinds of clogs and unpleasantness. In case you haven’t heard, “flushable” wipes aren’t actually flushable and neither are feminine products. The only things that should be flushed down the toilet are the human waste and toilet paper. You really don’t want to clog your toilet drain, as they can be some of the messiest to deal with. Strainers are probably one of the simplest preventative measures you can take for your drains, and one of the most effective. Putting strainers in your sink and tub drains helps ensure that nothing besides water gets in there, preventing slowness and clogs. It’s a lot easier to clean a strainer than it is to clean a drain! Give Master Plumbing a call at (301) 650-9100 or contact us online to get more information on how our expert plumbers can help you with your noisy water heater (or just about anything else plumbing related!). We have received Angie’s List Super Service Award recognition for plumbing and drain cleaning every year since 2007, in addition to the Best Plumber award from Best of Bethesda. We are fully licensed, bonded, and insured and our service is unparalleled. Give us a call today—you won’t regret it! To see examples of our projects, follow us on Facebook, Twitter, and Pinterest. This entry was posted on Friday, June 16th, 2017 at 5:11 pm. Both comments and pings are currently closed.